Early yesterday morning I arrived back in London from a week long stay in Fes, Morocco. So whilst I'm mourning the loss of warm weather for the next three months, I now get to write about my trip! Before leaving London, I really didn't know what to expect from Fes, or Morocco for that matter. I try to do some research before visiting a place so that I kind of know what I should do and what to be aware of. However, when trying to research Fes I couldn't find too much about it aside from the main attractions to see! I didn't know whether the location of my accommodation was any good, how safe it was or if any of the health horror stories were true. In a way though it is better sometimes if you don't know what to expect, as you end up pleasantly surprised, which I was! 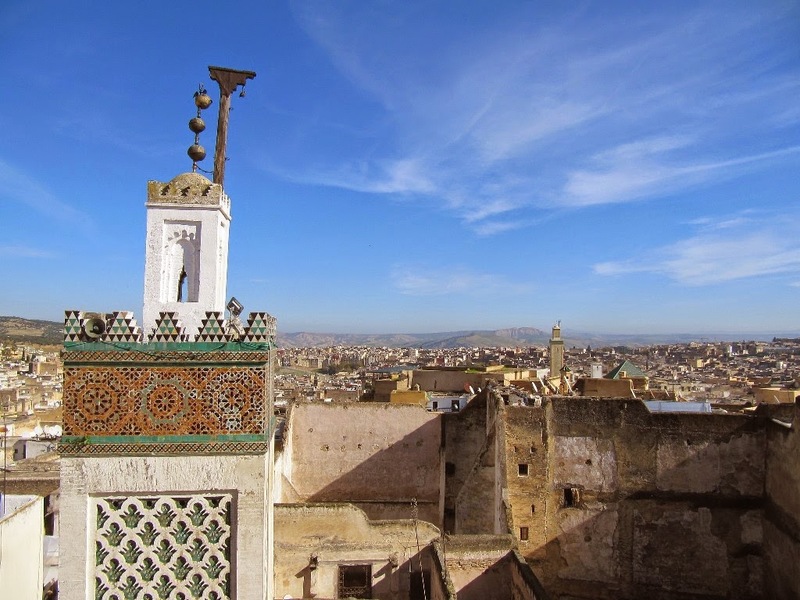 There is a couple of days worth of sights to see in Fes itself, and also a couple of worthy places to visit on day trips. You could easily see Fes in a weekend, but as I was there for a week I got to see some spots outside of the city and also go nice and slow seeing Fes. For the week I stayed in a Riad, which is a traditional Moroccan house (or in some cases palaces). They all have an inner courtyard or garden, and often have pools and fountains. I would say they are the most popular accommodation option in Morocco as they are beautiful buildings and are usually at a fairly reasonable price. The Riad I stayed in was almost 700 years old and the courtyard walls were covered in intricate wood carvings. The decor was beautiful with all sorts of old interesting decorations, as well as big lounges to relax on and a chess board to use. There were massive wooden doors on either side of the room, one leading to the breakfast dining room. During my stay there, I spent a lot of time in the courtyard playing chess & reading books, not to mention drinking amazing mint tea! When I managed to pull myself away from the peace of the riad, I found myself walking through the streets of the old medina. The medina (Fes el Bali) consists of over 9000 narrow streets, which twist and turn in all different directions. Because I visited in winter (despite it still being warm), most of the people passing through the bustling streets were locals, along with many donkeys, mules and hand pushed carts. A few times I found myself facing a large mule which had pushed through the people almost silently. The owner on the other hand had been shouting "Balak!" which is "watch out" in Arabic. That's one word I learnt pretty quick! There are so many things to buy in the various stores and souks in the medina. I didn't know where any particular souks were so I just wandered around seeing what there was. Haggling and bartering got a bit tiring, but I felt a sense of satisfaction after beating the price down by a third or half. I was probably still paying heaps more than I should have, but oh well! I ended up coming home with plenty of souvenirs, including a porcelain bowl, Moroccan teapot and an amazing scarf (which was a bargain £2.50!). My least favourite part of the medina would have to of been the meat section. It is only a very small part, but because it is near the entrance to the medina (the start is The Blue Gate or Bab Boujloud) it is one of the first parts I walked through. Walking through here for the first time I saw a camel head, bloody goat heads lined up along a stall, some unidentifiable things which I still have no idea what body part they are, and a stream of blood running down a gutter. I was very happy to get through this section and into streets with rug and teapot sellers! However, even though seeing camel heads isn't really my cup of tea first thing in the morning, it is these kinds of things that make a place special and authentic. If everything was to 'western' taste, the world would end up looking very much the same. The medina is so untouched by western modern-ness which is why I loved it. Only a couple of days in the medina are required until you have seen everything you need to see, so I headed out for a couple of day trips. I highly recommend getting out to see some of the places such as Meknes, Azrou and going into the Middle Atlas Mountains. It is easy to organise a driver and also fairly cheap considering the fact that you will have a person driving you anywhere you want to go for the whole day. Fes really is a special place and one I would love to visit again and again. The people are so genuine and friendly, the food delicious and the atmosphere is a world away from anywhere I've been before. I was very upset to be leaving and as I was watching my last sunset there I started dreaming about when I could return! Have you been to Fes or Morocco? What did you think? Thanks! I feel very grateful for the beautiful places I have had the chance to visit!